We've searched long and hard, and it just doesn't get any cooler (or more functional) than this. 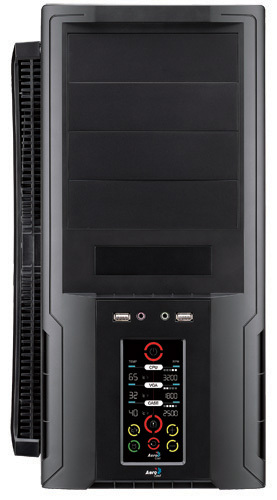 Boasting a Large Color Touch Button LCD, the Aerocool V-Touch Pro Computer Case can easily control up to four sets of fans and temperatures. Thanks to it's Touch Button Technology, the user will be able to quickly take advantage of the Power and Reset buttons, which also comes with a lock function to avoid careless mis-touch. The Aerocool V-Touch also comes with a ridiculously large 400mm fan on the side panel, giving the case the ability to deliver more than 250CFM of airflow. That's right, this high-performance enclosure comes with one of the biggest case side panels IN THE WORLD, and believe us, you can tell. Offering simple squeeze-and-lift for CD-ROM mounting, tool-free designs for 5.25 and 3.5" bays, and sufficient depth to install a high-quality PSU, the Aerocool V-Touch Pro Computer Case provides the users with plenty of ways to get their mod on. In addition, the S9 case also features over 7 PCI expansion slots, an HDD that can be rotated 90 degrees for easy installation, and extra fan space for an 80mm, 92mm, or 120mm fan.